When I was a little girl, I couldn’t wait until Dad brought in the freshly-cut evergreen tree and set it up in the living room. After he had strung the lights, we opened the boxes filled with glass ornaments from Germany carefully wrapped in tissue paper that Mother had inherited from her parents … the chalet with red shutters, the delicate silver and white chapel. Ah yes, that sweet memoir moment. 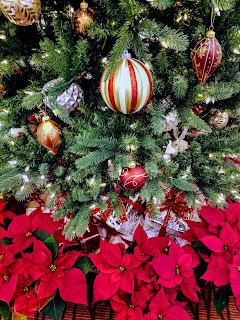 The family decorations, the traditions leading up to Christmas morning colored my childhood memories on this blog post when the anticipation of Christmas went fulfilled, most especially, with a new book. But the times are changing. As the mother of two millennials I am receiving a crash course. What is life? What is love? What is reality? What's happening to Christmas traditions? Neither of my sons is married, nor are many of their friends, although several are in long-term committed relationships. None is decorating their respective single-family homes, apartments, condos or townhomes with Christmas trees or decorations, Good heavens! Heresy! Some work at home so it would seem that even a small lit tree might add to the festivity and coziness of the house. The New York Times recently ran a story on creating coziness in the home. Hygge (pronounced HOO-gah) is the Danish concept of coziness. "If you’re not familiar, here’s a crash course, and if you want to dive in further (you will, and you should), here are some books to check out." When I asked my sons and their friends this weekend why no "hygge", no tree, no lights, they simply shrugged and laughed. Not interested, not important, who cares. Sometimes, the girlfriend wants to bring over a small artificial tree. That's tolerated. Maybe because none has children? Or maybe the concept of family and family traditions is changing? About twenty years ago when a friend of mine predicted that some day marriage would become “obsolete,” I thought it a bit absurd (and shocking). Poor me. Now, her prediction seems prescient of the times. Traditions that even I admit caused sweat to break out on Dad's brow as he labored to secure the tree with string and hooks and tighten the stand are going the way of a Sears catalogue. I think back on my own life (and I’m not that ancient …yet). By the time I was thirty-three, I had been married five years and had a child, our son Alex. Several years in a row, John and I traipsed out into snow-covered fields and cut down our evergreen or spruce tree. John at the time was the age Alex, who owns his own home, is now. Putting off marriage is another issue and women who pressure for "the ring" often confront a rude awakening. There seems no inclination to rush things, especially from the guy’s perspective. Millennials are working on their careers and paying attention to finances, saving to buy their own places, or already paying a mortgage. Having a baby is out of the question. Dating apps lead to their pick of people, if inclined. One person doesn’t suit, it’s on to another because many have lived through the shock of divorce and the financial ruin or challenges that accompanied that split. Marriage is serious business and means closure on one chapter in life many are still exploring. I find myself pondering these changing social dynamics and new story lines, away from the old tried-and-true boy meets girl, they fall in love, get married (or divorced), have 2.5 kids and get remarried and add more kids to an extended family. It’s beginning to sound as anachronistic as the dinosaur. 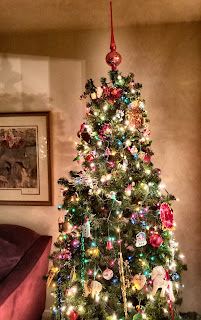 As for me, the (artificial) Christmas tree is up, strung with multicolored lights and hung with ornaments, including that glass chalet with red shutters … hung high enough so that Lily can’t reach up and chew my ornaments, which she has done in the past. I enjoy my “hygge”, living alone as I do. 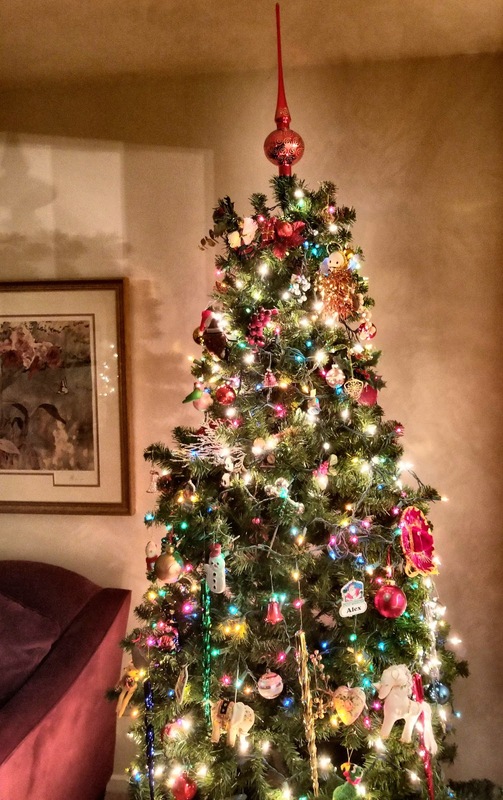 And I like that when my sons come over, a family Christmas tree in the living room greets them, just as it did when my parents were alive. In fact, I enjoy looking at it now over a cup of coffee and writing this. But as they say, Vive la difference! Who knows what the times will bring? I watch and listen, open to seeing and viewing a changing world. For, in the end, the writer must stay open to all that is happening, find in old stories a twist on the new and the surprising.